Western blot analysis of whole cell lysates probed with MALT1 antibody (VMA00038) followed by detection with HRP conjugated Goat anti Mouse IgG (1/10,000, STAR207P) and visualized on the ChemiDoc MP with 200 second exposure. Arrow points to MALT1 (molecular weight 92 kDa). MALT1 antibody recognizes mucosa-associated lymphoid tissue lymphoma translocation protein 1, also known as MALT lymphoma-associated translocation or paracaspase. The antibody has been extensively validated for western blotting using whole cell lysates. Mouse anti Human MALT1 antibody recognizes human mucosal-associated lymphoid tissue lymphoma translocation 1 (MALT1), also known as MALT lymphoma-associated translocation and paracaspase. MALT1 is an 824 amino acid protein belonging to the peptidase C14B family containing a single death domain and two Ig-like C2-type domains. In normal lymphocytes, MALT1 plays an important role in antigen receptor-mediated lymphocyte activation. In T-cells MALT1 is recruited by activated CARMA1, along with Bcl-10, to form a CARMA1-Bcl10-MALT1 (CBM) complex which is involved in the activation of NF-kappaB (Yang et al. 2013). MALT1 was initially identified as a recurrent translocation t(11;18)(q21:q21) in mucosal-associated lymphomas (Horsman et al. 1992), which creates a functional fusion oncoprotein consisting of MALT1 and apoptosis inhibitor API2 (Dierlamm et al. 1999). Studies suggest that overexpression of MALT1, or expression of the API2-MALT1 fusion protein, leads to the uncontrolled activation of NF-kappaB which is stimulus-independent (Zhou et al. 2005). Mouse anti Human MALT1 recognizes both MALT1 and the MALT1-API2 fusion protein (Rosebeck et al.2011, Murga Penas et al. 2007). The MALT1-API2 oncoprotein plays a role in non-canonical activation of NF-κb through NIK cleavage. Mouse anti Human MALT1 antibody recognizes human MALT1 as a single band of ~92 kDa in multiple human cell line lysates by western blotting under reducing conditions. 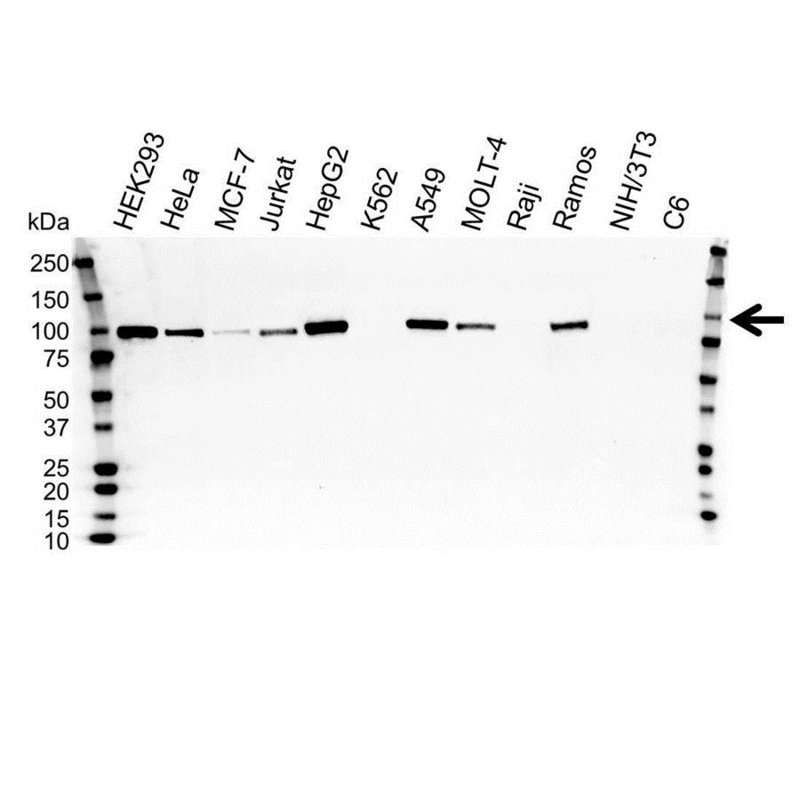 Anti MALT1 antibody detects a band of approximately 92 kDa in HEK293 cell lysates.